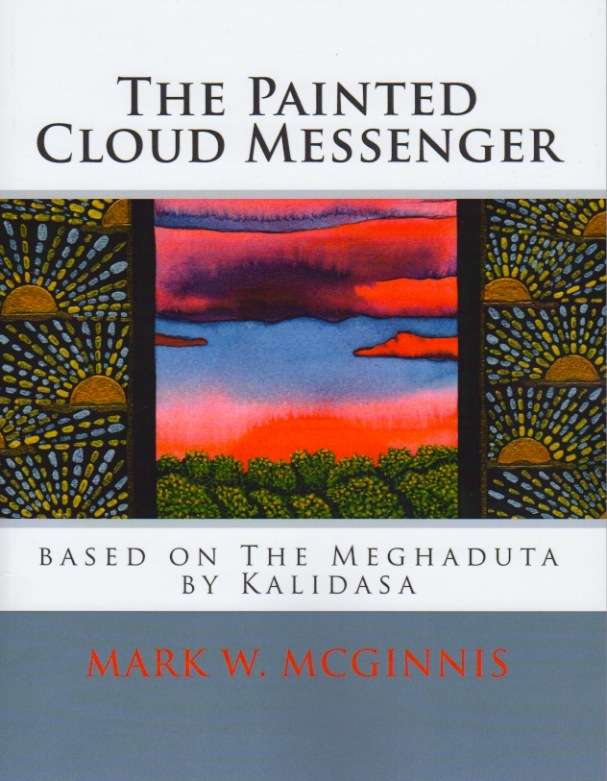 This book of 90 paintings is based on a poem titled Meghaduta (Cloud Messenger) by India’s greatest Sanskrit poet, Kalidasa (c. 400-500 AD). His surviving work includes plays, epic poems and lyric poems. Cloud Messenger is among the latter — a remarkable love poem. It is a story of a Yaksha (a semi-god) who has been banished for a year to a remote mountain for neglecting his duty to his master, Kubera, the god of wealth. After eight months of separation from his beloved young wife he sees a cloud touching the mountaintop and the poem is a long monologue by the Yaksha to the cloud. He asks the cloud to carry his message of love to his wife. He then goes on to describe the journey the cloud will have to his wife’s distant dwelling and outlines the details of their meeting. It is a vibrantly visual poem filled with sensuous detail. While I find the love poem wonderful in its fantasy, sincerity and tasteful eroticism, what drew me to the poem so strongly was its sumptuous description of the natural world. Its vivid narrative of the land, sky, trees, plants, flowers, animals and birds created paintings in my mind on my first reading. After studying many translations of the poem I rewrote it to put it in a more accessible voice for the contemporary reader, taking some liberties for artistic expression and story clarity. The original paintings are 8 ½” X 8 ½”, acrylic on paper. The style of paintings are a fusion of my study of Kangra paintings of the 18th and 19th century India and my own stylistic development of the past 35 years. It is my hope that Cloud Messenger will bring the viewer appreciation for this ancient classic and increased interest in the literature and culture of India.